Patient education is one of the most important aspects of nursing care. It builds patient's self-esteem, self-awareness, sense of responsibility, and effective coping mechanism. Furthermore, it reduces readmission rates in hospital, rise in healthcare costs and decreases mortality and morbidity across the lifespan. Nurses have to assess patient's barriers, readiness, and knowledge level before they start the teaching process. Nurses include these in their care plans and have to evaluate outcomes continuously. 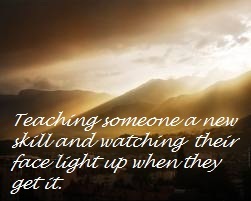 Yet, sometimes we do come across situations where teaching becomes tricky. I believe it''s because patients become intimidated with the unfamiliarity of hospital environment and confusing medical jargons, In turn, it throws them off out of the norm, making the learning process tougher to deal with. School was tough growing up for me. I was not your A student. I struggled through a lot, simply because I had a hard time understanding the materials. And as I got older and went back to nursing school, I found out in my own little ways a more effective way of learning the materials. One way is to relate a concept to an event or certain aspect in my life and I can somehow get clarity. When I worked in the orthopedic floor, I had a 55 year old male patient who had a right total knee replacement. He was POD #2 and I noticed his frustration with the rehab process. I am big on pain management, so I made sure to medicate him for pain, on a regular basis. Toradol was my drug of choice. I started paying him more attention because he was struggling with the coping process. Through therapeutic communication, I found out that he worked as a contractor. He loves what he does and he wants to go back to work right away. Perfect! Bones = foundation! So, I started teaching him a concept that I believe he can relate to. I told him his bones, just like the foundation / trusses in a house need to be strong so the house can stay stable. He gave me a smile. His wife approached me later on that day and thanked me for making everything seem familiar for his husband. I was taking care of a newly diagnosed type 2 diabetic on the telemetry floor. He had diabetic teachings done and it was discharge day when I took care of him. Yet, I can sense that he was a little unsure of the whole concept of the disease process. I asked him what he did for a living and he told me he is a truck driver. Perfect! I told him pretend that his 18 wheeler has a small 4 cylinder engine. The 4 cylinder engine is not enough to operate a huge 18 wheeler. I told him that his pancreas is like a 4 cylinder engine inside his body. It cannot supply enough insulin to keep his blood sugar under control. He needs to lose weight, eat right, exercise, and take his medications in order to control blood sugars effectively. He gave me a smile, nodded his head and thanked me for explaining the concept where he can understand better. Patient education requires critical thinking. Nurses as critical thinkers have the ability to engineer through multiple tasks. Nurses are no longer simply responsible for giving out medications, communicating with physicians or other healthcare personnel, and coordinating care for the patients. We nurses now have a crucial role of making sure that patients are able to independently manage their disease. Through "pasensiya"- "patience", recognizing "teachable moments, and using basic principles, nurses truly make a huge impact not only in the quality of lives for patients, but also to the empowerment of the nursing profession. Your experience and life story have a importance for all us. Nurses truly make a huge impact not only in the quality of lives for patients, but also to the empowerment of the nursing profession which we want from her.